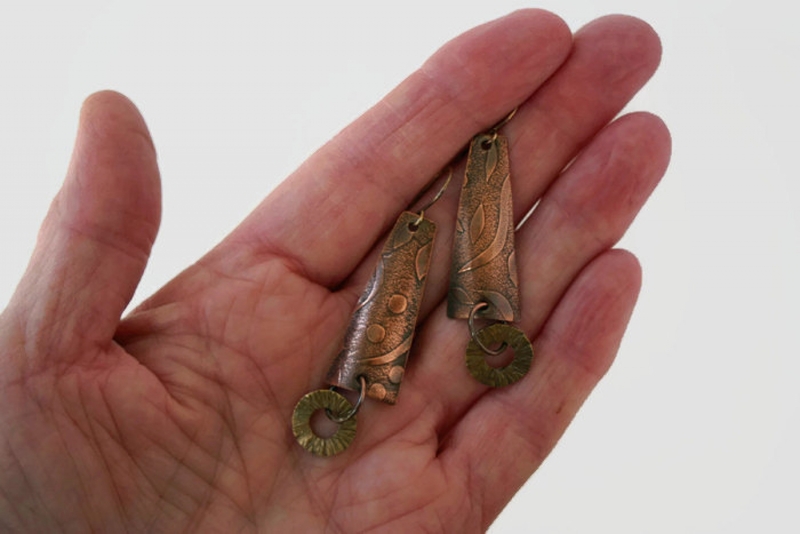 Pattern textured copper and brass long dangle earrings. The texture is created by heating copper sheet metal and rolling it through my rolling mill with a pattern plate then domed to give them a nice curve. 2 1/4 " long x 1/2 " wide they hang from my nickel free sterling wires for wearing comfort (these wires have an antique patina). Boho, earthy, rustic, hippy chic, whatever you call them, they add fabulous funk to your wardrobe! I ship USPS and try to mail out same day whenever possible. I accept PayPal, and you may use your credit card during this checkout, you do not need an account with Paypal simply click "other payment" to use your card. Priority shipping upgrade is available to you in the checkout cart.